The state Department of Environmental Conservation said Tuesday that it will take another two months to review a proposed expansion of a crude oil terminal at the Port of Albany, less than a week after the terminal owner questioned whether the agency was improperly dragging its feet because of wider concerns on the safe transport of crude oil statewide. Citing "broad public and community interest," DEC again extended the public comment period on a proposal by Global Companies through Aug. 1. Last year, the company filed for a state air pollution permit to heat crude oil from rail cars to make shipping it down the Hudson River easier. This is the fourth extension of the comment period since December, and it comes after the DEC in March submitted a long list of questions to Global as public opposition intensified. The comment period was to end in December, but the DEC extended that to January, then to April, then to June, and now to August. That step came only days after an Albany law firm representing Global wrote a 32-page letter to the DEC with responses to the agency's March questions — and to contend that the DEC would be overstepping its bounds by linking the project to larger questions about the safety of surging rail transportation of highly volatile crude oil through Albany and elsewhere in the state. Global also challenged the usefulness of a DEC plan to begin air pollution testing around the port. "Concerns over rail transportation should not be used to serve as an indirect attempt to regulate activities outside the jurisdiction of the (DEC)," wrote Dean S. Sommer, an attorney with the firm of Young/Sommer, in a May 15 letter to DEC regional air permit chief William Clark. "Concerns over rail transportation should not be confused with a scientific evaluation of the ... air permit request." Some opponents have questioned whether the heating plant would allow Global to accept Canadian tar sands oil, a heavier type of crude that can become too thick to pump in colder temperatures. Already, Global and another company at the port, Buckeye Partners, accept massive trains carrying hundreds of millions of gallons of Bakken crude from North Dakota. Trains in Canada, North Dakota, Virginia and Alabama have derailed and exploded into massive fires because the most commonly used tanker cars are prone to rupturing in a derailment. The Canadian explosion killed 47 people in the small town of Lac-Megantic, Quebec. There have been four such derailments in New York since last year, but none involved explosions or spills. Such accidents have sparked fears among residents of Albany's South End, in which the port is located. In some cases, rail cars are stored close to residential areas, including the city-ownedEzra Prentice Homes housing project. The issue has picked up political traction, with Gov. Andrew Cuomo this month getting a report from DEC and other state agencies on the risks of crude oil transport. The governor has urged stricter standards by the federal government, which oversees rail transportation. Albany County Executive Dan McCoy has declared a county moratorium on the crude heating project based on county health law. In March, the state demanded that Global answer some 20 questions about fire risk, evacuation plans, spill response and insurance coverage for accidents. DEC also warned it could yank its November ruling that crude heating would have no negative impact on the environment — a step that would trigger a much more detailed state review. DEC described its November ruling as "interim," but Sommer countered that such a concept does not exist legally. "This is mentioned solely to make clear that the rule of law, not political considerations, must prevail in this process," he wrote, calling the department finding on the project "final and binding." He added that the DEC appears to have a "collateral agenda" on rail transportation of crude oil and hinted that Global might have grounds for a legal challenge against the state. "Straying from the rule of law has, among other things, due process implications," wrote Sommer. 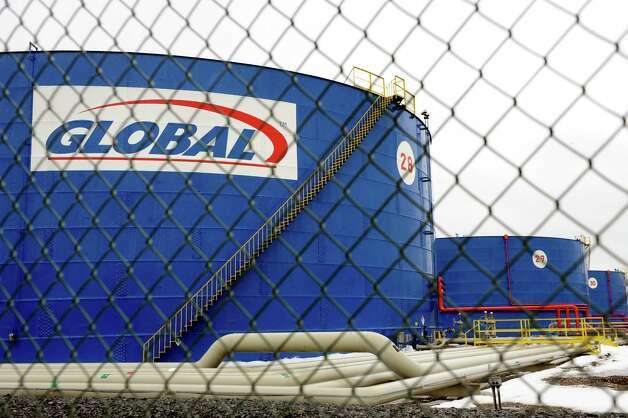 Out of concern that Global is being treated differently from other oil-handling businesses in the state, the company has filed a Freedom of Information Law request with the DEC seeking "information in this regard and other crude oil-related matters," he wrote. Sommer's letter to DEC also included responses to the March questions which are "under review by DEC to determine whether it is complete," according to a DEC news release. "DEC will not make a final determination on pending permit applications until it has fully reviewed all issues and only after the impacted communities are provided meaningful opportunities to learn about and comment on the proposals." The agency is also moving ahead with plans to install temporary air pollution sensors around the port that will measure volatile organic compounds, a class of potential carcinogens which are emitted as gases. VOCs are constituents of crude oil, but also come from other sources. Given that the port contains a number of other industrial uses and is next to heavily traveled Interstate 787, the results of such air tests are "unlikely" to show the specific sources of VOCs, Sommer wrote. "Global is uncertain of the conclusions to be drawn from a regional air survey, but notes that such data will provide no scientifically valid data as to Global's terminal operations."